Green seems to be everybody's favorite color these days. There's environmentally conscious appliances, all-natural foods, even eco-friendly clothing. But while these products are widely accepted as healthy for our planet, they are not always known for being healthy for your wallet. However, when it comes to keeping your home healthy and clean, you do not have to worry about breaking the bank on green cleaning products. We have compiled a list of easy do-it yourself cleaning methods that allow you to keep your hard-earned green just as bright as you'd like your kitchen countertops and bathroom floors to shine. Happy cleaning! You can use vinegar straight out of the bottle to wipe down the surfaces of your fridge, cabinets, shelves, sinks, glass, china, crystal, countertops, and painted surfaces. You can also use a vinegar-soaked rag to remove scaling and mineral buildup around shower fixtures or other faucets simply by wrapping the rag around the problem area for a few hours to loosen the grime for easy scrubbing. Unlike many chemical cleaners, you do not have to rinse the area after application. To make your own household spray cleaner, all you have to do is fill a spray bottle with an equal amount of water and vinegar. Add a few drops of an essential oil, such as peppermint or rose, or fresh-squeezed lemon juice to give the mix a pleasant, clean smell. 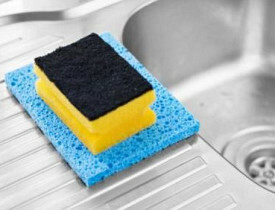 Then use it as an all-surface cleaner throughout the house. This mix is especially useful for protecting against mildew and soap scum in the bathroom by the shower or tub, as well as in and around the kitchen sink. To clean spot-prone windows inside or outside of your house, mix 2 cups of water with 2 drops of castile soap and 3 tablespoons vinegar in your spray bottle and check to make sure the spray doesn't leave streaks. If it does, add more vinegar slowly until you find the right ratio of ingredients. (Castile soap is recommended because it is organically made from vegetable oil, as opposed to animal fat.) Again, there's no need to rinse the windows after this all-natural cleansing. In short, making your own cleaning products will save you money and help you to create a healthier and cleaner environment within your home. Vinegar is a safe alternative to the petrochemical detergents that most household cleaning products contain these days. Such chemicals can make their way into our air, water, and even our bodies when they evaporate. This can aggravate allergies, headaches, irritability, and toxicity within your home. Natural cleaning agents help reduce these conditions and help you maintain a home free of hazardous waste.